A groundbreaking Nature Geoscience article co-authored by UD geochemist Neil Sturchio describes a new method to accurately date groundwater. 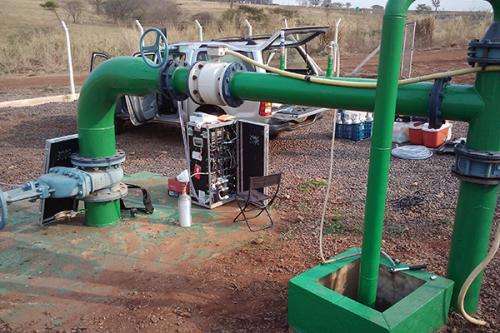 Pictured at a well in Brazil is machinery used for the extraction of dissolved gases from groundwater. The apparatus extracts the gases as the water flows through and compresses them into a small aluminum cylinder. (Phys.org) —Neil Sturchio, chair of the Department of Geological Sciences at University of Delaware, is co-author of a Nature Geoscience paper detailing a pioneering new technique to date groundwater. Knowing the age of the groundwater provides important clues about the sustainability of water resources, information that is particularly important in dry or arid climates. The technique involves measuring Krypton-81, a rare isotope produced by cosmic rays in the Earth's atmosphere. Sturchio explained that as rain is absorbed into the ground, a miniscule amount of the isotope comes with it. There are only about 1,000 atoms of Krypton-81 in a liter of water, but with a half-life of 229,000 years, it remains in the groundwater nearly one million years and can be tracked and quantified as it moves through the aquifer. "In principle, if you take samples along the aquifer, the further into the aquifer you go the less Krypton-81 is present and the older the water," said Sturchio, who joined the College of Earth, Ocean, and Environment this fall. During fieldwork in Brazil, Sturchio collected water samples from various wells along the Guarani Aquifer, one of the world's largest freshwater aquifer systems. He estimates that the oldest water sample they collected was approximately 830,000 years old. Building on previous work, he collaborated with colleagues at Argonne National Laboratory who developed a laser atom-trap capable of counting the number of Krypton-81 atoms in groundwater. It is one of only three such devices worldwide. Using a method called atom-trap trace analysis, Sturchio's research team separated the Krypton from the other dissolved gases extracted from the water, then measured the ratio of Krypton-81 to the total Krypton present. A second set of samples was collected later and prepared for analysis by researchers at University of Bern in Switzerland. Carbon-14 has been the prevailing technique for groundwater dating since its development in 1949, but it can provide an age for materials only up to approximately 60,000 years old. Researchers also have used Helium-4 to date groundwater in aquifers with varying results because naturally occurring helium from basement rock can skew measurements and make the water appear older than it is. Krypton-81, however, only comes from the atmosphere, eliminating questions about the source. The researchers developed a general model by which Krypton-81 measurements could be used to validate the Helium-4 ages for the same water samples. Their model provides researchers a way to correct the variability caused by the natural helium emanating from the basement rock. "Now that we've been able to make sense of the helium concentrations, we can apply this model to other locations, even in places where the Krypton-81 measurements don't exist," Sturchio said. Helium measurements exist for a lot of places and can be measured on a thimble full of water. While water resources in states like Delaware are not at risk, Sturchio said the technology could help states like California and Arizona that have experienced severe drought in recent years. "Water levels in the aquifers there are gradually declining because water is pumped out faster than it is replenished, raising questions of sustainability. This is a basic concern, and knowing how old the groundwater is can help determine how much water can be pumped out annually without depleting reserves," he said. In areas where aquifers straddle international borders, like in North Africa and South America, groundwater dating could also provide important clues about how long current water resources are likely to last, a potential political minefield if one country is found to be extracting another's water resources.